A song based on Revelation begins, “Lo, the kingdom of the world is now the kingdom of the Lord!” This line of the song comes from Revelation 11:15, “the seventh angel trumpeted; and there were loud voices in heaven, saying, The kingdom of the world has become the kingdom of our Lord and of His Christ, and He will reign forever and ever.” This “forever and ever” points to New Jerusalem, the center of God’s eternal kingdom. The song continues, “O what joy to all the saints does His eternal reign afford!” All who believe into Christ Jesus are saints because we have been “sanctified in Christ Jesus” (1 Cor. 1:2). And we have His joy now and more so in His eternal reign in New Jerusalem. The second verse of the song speaks of Satan being cast down. The third continues, “Now is come salvation, power, and the kingdom of our God.” The fourth declares our overcoming by the blood of the Lamb, our testimony, and not loving our soul life. These three song verses present Revelation 12:9-11. 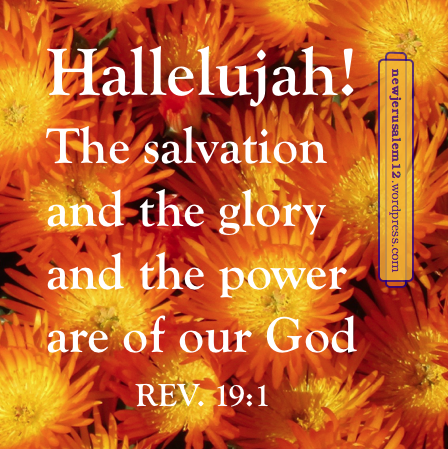 Revelation 12:12 says, “Therefore be glad, O heavens and those who dwell in them.” This is echoed in words of praise in the song, including the chorus, Vict’ry, vict’ry, Hallelujah! The victory is won! All these judgements are part of God’s clearing away of the old creation, so that He can bring in the new creation with New Jerusalem. And all of our praises develop the life of New Jerusalem within us. I copied the graphic from a prior post on praising, since that post also is on Rev. 19:1.